The article is devoted to the clarification of the importance of administrative-legal support for the development, promotion, improvement of the state of ecological safety in Ukraine, and the place of administrative-legal norms in regulating environmental relations. Particular attention is devoted to the problems in the field of environmental safety. The article outlines the directions of increasing the efficiency of administrative-legal provision of environmental safety in Ukraine and presents their analysis. Taking into account the emergence of new challenges and threats to environmental safety, the proposal for the formation of a strategic program in Ukraine to improve the legal security of Ukraine's ecological safety is presented. 1. Raikher V. K. Obshchestvenno-istoricheskie tipy strakhovaniya[Socio-historical types of insurance], Moscow, 1947. 284 p. 2. Semchyk V. I., Kulynych P. F., Yermolenko V. M. Problemy rozvytku ahrarnoho ta zemel'noho prava Ukrayiny [Problems of development of the agrarian and land law of Ukraine], Kyiv, 2013. 372 p. 3. Kolpakov V. K. Administratyvne pravo Ukrayiny [Administrative Law of Ukraine], Kyiv, 2000. 752 p.4. Obshcheteoretycheskaya yurysprudentsyya red. Yu. N. Oborotova [General theoretical jurisprudence], Оdessa, 2011. 436 p. 5. Lazarenko V. A. Administratyvno-pravove rehulyuvannya ekolohichnoyi bezpeky v Ukrayini. Avtoref. dis. kand. yurid. nauk [Administrative and legal regulation of ecological safety in Ukraine]. Kyiv, 2010. 20 p. 6. Iyerusalimova I. O., Iyerusalimov I. O., Pavlyk P. M., Udovenko Zh. V. Administratyvno–pravove zabezpechennya prav i svobod lyudyny ta hromadyanyna [Administrative-legal protection of the rights and freedoms of man and citizen], Kyiv, 2007. 223 p. 7. Bryhadyr I. V. Shchodo vyznachennya ekolohichnoyi bezpeky yak pravovoyi katehoriyi [Concerning the definition of environmental safety as a legal category], Forum prava. 2010, vol. 4, pр. 109–114. Avalable at: http://www.nbuv.gov.ua/e-journals/FP/2010-4/10bivjpk.pdf. (accessed 09.03.2018). 8. Тylips'ka O. Yu. Ponyattya i zmist administratyvno-pravovoho zabezpechennya prava na myrni 85 zibrannya v Ukrayini [The concept and content of administrative and legal provision of the right to peaceful assembly in Ukraine], Аktual'ni problemy vitchyznyanoyi yurysprudentsiyi. 2016, vol. 3, pp. 124–128. 9. Lazarenko V. A. Administratyvno-pravove rehulyuvannya ekolohichnoyi bezpeky v Ukrayini. Avtoref. dis. kand. yurid. nauk [Administrative-legal regulation of ecological safety in Ukraine]. Kyiv, 2010. 20 p. 10. Mel'nychenko O. A. Elementy derzhavnoyi ekolohichnoyi polityky [Elements of state environmental policy], Derzhavne budivnytstvo. 2016, vol. 2. Avalable at: http://www. kbuapa.kharkov.ua/e-book/db/2016-2/doc/1/01.pdf. (accessed 09.03.2018). 11. Lychenko I. O. Administratyvno-pravove rehulyuvannya vidnosyn u sferi zakhystu prava vlasnosti [Administrative and legal regulation of relations in the field of property rights protection], Visnyk L'vivs'koho universytetu. Seriya yurydychna. 2008, vol. 46., pp. 81–87. 12. Pro Osnovni zasady (stratehiyu) derzhavnoyi ekolohichnoyi polityky Ukrayiny na period do 2020 roku. Zakon Ukrayiny vid 21.12.2010. [About the Basic Principles (Strategy) of the State Environmental Policy of Ukraine for the period up to 2020], Vidomosti Verkhovnoyi Rady Ukrayiny. 2011, vol. 26, p. 1284.13. Pro osnovy natsional'noyi bezpeky Ukrayiny Zakon Ukrayiny vid vid 19.06.2003. [About the Fundamentals of National Security of Ukraine], Vidomosti Verkhovnoyi Rady Ukrayiny. 2003, vol. 39, p. 351.14. Osnovni napryamky derzhavnoyi polityky Ukrayiny v haluzi okhorony dovkillya, vykorystannya pryrodnykh resursiv ta zabezpechennya ekolohichnoyi bezpeky.Postanova Verkhovnoyi Rady Ukrayiny vid Postanova Verkhovnoyi Rady Ukrayiny vid 05.03.1998. [The main directions of the state policy of Ukraine in the field of environmental protection, use of natural resources and ensuring environmental safety], Vidomosti Verkhovnoyi Rady Ukrayiny. 1998, vol. 38, p. 248. 15. 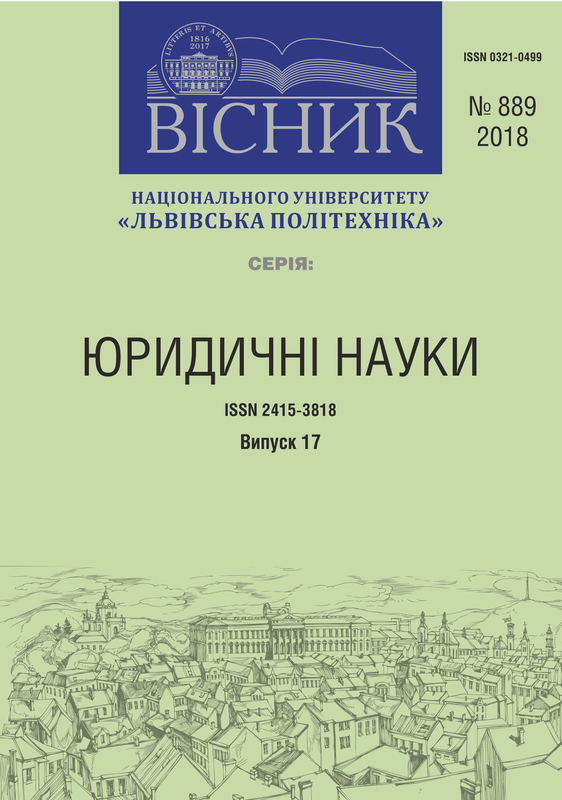 Komarnyts'kyy V. M. Mekhanizm administratyvno-pravovoho zabezpechennya ekolohichnoyi bezpeky: ponyattya ta skladovi [Mechanism of administrative and legal provision of environmental safety: concepts and constituents], Visnyk Luhans'koho derzhavnoho universytetu vnutrishnikh sprav imeni E. O. Didorenka. 2015, vol 1, pp. 179–188. Avalable at: http://nbuv.gov.ua/UJRN/Vlduvs_2015_1_20 (accessed 09.03.2018). 16. Yurchenko L. I.. Ekolohichna polityka yak vrakhuvannya skladnykh vzayemyn ekolohichnoyi kul'tury i ekolohichnoyi bezpeky [Ecological policy as taking into account the complex relationships of ecological culture and ecological safety], Mul'tyversum. Filosofs'kyy al'manakh. 2008, vol. 70., pp. 192–200. 17. Zarzhyts'kyy O. S. Aktual'ni problemy pravovoho zabezpechennya ekolohichnoyi polityky Ukrayiny (teoretychni aspekty)[Actual problems of legal provision of ecological policy of Ukraine (theoretical aspects)], Donetsk, 2012. 200 p. 18. Pyts' V. M. Administratyvno-pravovi zasady zabezpechennya ekolohichnoho pravoporyadku. Avtoref. dis. kand. yurid. nauk [Administrative and legal principles of environmental law enforcement]. Lviv, 2015. 21 p. 19. Hamalyuk B. M. Diyal'nist' Natsional'noyi politsiyi Ukrayiny z dotrymannya derzhavnykh ekolohichnykh harantiy: teoretyko-metodolohichnyy aspekt [The activities of the National Police of Ukraine on compliance with state environmental guarantees: theoretical and methodological aspects], Naukovyy visnyk L'vivs'koho derzhavnoho universytetu vnutrishnikh sprav : Seriya yurydychna. 2016, vol. 3. , pp. 150–161. 20. Pronevych O. S. Instytutsionalizatsiya ekolohichnoyi politsiyi: stan administratyvno-pravovoho dyskursu [Institutionalization of ecological police: state of administrative-legal discourse], Zhurnal skhidnoyevropeys'koho prava. 2018, vol. 47., pp. 6–15. 21. Fesyanov P. O. Derzhavne rehulyuvannya ekolohichnoyi bezpeky na rivni rehionu. Avtoref. dis. kand. and. nauk z derzh. upravlinnya [State regulation of environmental safety at the regional level]. Kyyiv, 2013. 20 p.
Lychenko І. "Еnhancement of efficiency of administrative-legal environmental security in Ukraine". http://science.lpnu.ua/law/all-volumes-and-issues/volume-5-number-889-17-2018/enhancement-efficiency-administrative-legal.